The BAMB Consortium is pleased to invite you to participate in BAMB’s final event “BUILDINGS AS MATERIAL BANKS – A PATHWAY FOR A CIRCULAR FUTURE” (SBE19 Brussels – BAMB-CIRCPATH). Circular economy; Reversible Building Design; Materials Passports; Circular Building Assessment. This conference, will provide a regional perspective on the RCRA, Air and Wastewater compliance issues you care about every day, including enforcement and policy/regulation changes. Renewable Energy forms one of the pillars for delivering global sustainable environment and the commitment to climate change targets. The renewable energy industry has matured, with huge investments being ploughed into it globally. Global new investment in renewable energy (excluding large hydro-electric projects) was around US$241.6 billion in 2016, with over 138.5GW of added renewable power capacity worldwide. This capacity is equivalent to 55% of all the generating capacity and was approximately double that in fossil fuel generation in 2016. International Conference on Renewable Energy series addresses research and development in renewable energy technologies including energy efficiency. It is an annual meeting planned to be held in a different countries, initially within Europe, with Asia, Middle East, Africa and Latin America being highlighted as target regions for the conference. Topics: Renewable Energy technologies – solar, wind, wave, tidal, geothermal, bioenergy, hydropower Energy storage concepts and materials Renewable energy integrations and energy networks Innovation in energy efficiency and architecture Energy access, gender and development Economics social and environmental and policy aspects Energy and climate change. The Ecological Forecasting Initiative (EFI) is a broad, interdisciplinary effort aimed at promoting the use of forecasts to understand, manage, and conserve ecosystems and the services they provide. The EFI 2019 meeting is aimed at bringing together scientists, agencies, industry, and stakeholders to build a community of practice and advance research, applications, and collaboration around near-term (subdaily to decadal) ecological forecasts. The main theme of the 23rd TAP Conference is “2020-2030: Transport in critical transition”. Indeed, this decade will determine whether transport systems will succeed in moving ahead with their sustainability targets. In this direction, specific areas include electromobility in the road sector, clean maritime shipping, fuels and energy decarbonization, air pollution / climate change trade-offs, low emission engines and vehicles, enhanced air quality modelling tools and their impacts on regulation and decision making. Borderstep Impact Forum 2019: Data centers - the energy-efficient foundation of digitalisation? The increasing digitalization of business and society is leading to a dynamic increase in the volume of data being generated and saved in data centres. This development puts significant strains on the environment. The application and usage of energy-efficient technologies plays an important role here. The Borderstep Impact forum taking place on May 21, 2019 will discuss, which challenges and prerequisites are tied to the development of more sustainable data centers. LuWQ2019 is an interdisciplinary conference on the cutting edge of science, management and policy to minimise effects of agriculture and land use changes on the quality of groundwater and surface waters. The conference aims to discuss the entire ’policy cycle’ to enable enhancing the quality of the water environment, which includes problem recognition, formulation of technical options, policy formulation, interaction between policy makers and stakeholders (i.e. pressure groups), policy implementation, monitoring and research. The conference also aims to facilitate networking opportunities between scientists of different discipline backgrounds i.e. economic, social and natural sciences, as well as between scientists, water managers and policy makers. Following a successful first event in 2017 the Conference on Community Ecology is moving from Budapest to Bologna. The second event is specifically focused on the theoretical and applied progress on all the aspects of community ecology. The scientific focus is on all taxa and all aspects of community ecology, including the effects of global change on biological communities, landscape ecology, multivariate statistics, systems ecology, vegetation science, macroecology and many other fields. Students and senior researchers might find attending this conference useful and enjoyable in an international and interdisciplinary scientific environment. As the suitable location for Solar PV and CSP growing and the high potential for wind energy, the North Africa Region is accelerating the development of Renewable Energy, in order to meet the increasing energy demand while fighting climate change. With GOV’s great support and so many ongoing & upcoming renewables projects, this is best time for you enter this market. Taking place in Casablance, Morccco during June 24-25, 2019, The 2nd North Africa Renewable Energy Summit will pave a knowledge-sharing platform for you to network with Developers, EPCs, Financers, Suppliers, etc. Focusing on Morocco, Tunisia, Algeria and Egypt, We’re not only analyse the updates and forecasts of North Africa’s Renewbales Development during this Two-Day-Summit, but also arrange an extra Post-Confernece Site Tour which hosted by Masen (Moroccan Agency for Sustainable Energy). Soundscape practice for environmental acoustics offers a variety of ways to supplement traditional acoustic engineering practices and community engagement. This event will explore the practical application of soundscape principles and technology being used in real-world projects, and the application of soundscape research to ongoing and future work. The 11 International Exergy, Energy and Environment Symposium (IEEES-11) is an initiative aimed at bringing together the academicians, researchers, scientists, technocrats and practicing engineers in the eld. As a confluence of many disciplines, this International Symposium/Conference serves as a forum that promulgates ideas, experience, and knowledge of the fellow researchers and engineers working on sustainable energy systems across the globe. It is worthy to note that IEEES-11 covers a diverse assortment of cutting-edge topics, including Clean Coal Technologies, Renewable Energy Technologies, Smart Energy Systems, Alternative Fuels, Hydrogen and Fuel Cell Technologies, Nuclear Energy, Desalination Technologies, and Environmental Technologies. Algae Fuels, Bio-Waste Utilization, Cogeneration and Micro-Generation, Combustion, Pyrolysis, and Gasification Technologies, Desalination Technologies, Electro-Chemical Devices(Fuel Cells, Capacitors, Batteries, etc. ), Energetic System Optimization, Energy Systems and Applications, Environmental Engineering Technologies, Environmental Impact Assessment, Exergy Analysis and Modeling, Fossil Fuels, Green Buildings, Green Energy Technologies, Green Transportation Vehicles, Heat and Mass Transfer, Hydrogen Production and Utilization Technologies, Life Cycle Assessment, New Materials for Energy Applications, Nuclear Energy, Refrigeration and Heat Pump Systems, Renewable Energy Systems, Sectoral Energy Management, Smart Grids, Sustainable Communities, Sustainable Development, Sustainable Mobility, Synthetic Fuels, Thermal comfort and Green Transportation Vehicles, Thermal Systems and Applications, Thermodynamic Optimization, Tri-generation Systems. For 29 years, the Society for Conservation Biology's International Congress for Conservation Biology is where new conservation trends and science-based knowledge unites with community resources. More than 1,800 biodiversity and conservation professionals from over 70 countries will gather in Kuala Lumpur, Malaysia to learn of the latest science, technology, policies, and sustainability efforts driving change in Southeast Asia and across the globe. 1,800 research, government, NGO, environmental non-profit, corporate CSR and sustainability stakeholders, and academic and future leaders attend from both the private and public sectors. The Geography Departments at Macalester College and the University of Wisconsin – Eau Claire are pleased to host the 2019 International Geographical Union Commission on the Sustainability of Rural Systems (IGU-CSRS) Colloquium and Field Study. The 6-day Colloquium fosters international collaboration and information exchange specifically focused on concepts of economic, social, and environmental sustainability of rural systems. The 2019 International Conference on Green Energy and Environmental Technology is organized by academics and researchers belonging to different scientific areas of the University Complutense of Madrid, University Carlos III of Madrid, University of Extremadura and University of Las Palmas de Gran Canaria with the technical support of Sciknowledge European Conferences. MADAGASCAR ATBC 2019 aims to gather researchers, students, and professionals in a range of scientific disciplines from around the world in order to provide an effective tool towards this common effort to harmonize biodiversity conservation and human well-being. The Third World Irrigation Forum (WIF3) and 70th International Executive Council (IEC) Meetings will be organized by Indonesian National Committee on Irrigation and Drainage (INACID) in co-operation with ICID. The main theme of the Forum is ‘Development of water, food and nutrition security in a competitive environment’. The International Conference on Sustainable Development is organized by the European Center of Sustainable Development in collaboration with CIT University. The Conference theme is: "Creating a unified foundation for the Sustainable Development: research, practice and education". CEST biennial series has become one of the worldwide leading environmental events gathering experts, scientists, entrepreneurs as well as representatives of public administration and social initiatives presenting state-of-the-art research and addressing emerging environmental issues. 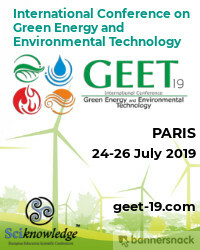 A selection of topics for which the Scientific and Programme Committee is particularly seeking contributions can be found https://cest2019.gnest.org/thematic-areas-and-topics. The aim of the 10th Forum is to show the latest results of research and applications from various scientific institutions around the world. Additionally, we want to promote Ecological Engineering as an area of knowledge in the field of environmental protection. Between 1950 and 2050 the global population will have increased significantly, from 2.5 to 10 billion inhabitants. The urban population is expected to be two thirds, up from one third a century ago. The consequence is a greater urban spread into rural environments and increased pressure on natural resources, including groundwater in these transition areas. The conference theme, Groundwater quality in the transition between rural and urban environments, will focus on the need to protect, manage, repair and sustain groundwater quality in these growing urbanized environments. The conference will bring together researchers, industry, regulators, contractors, consultants, planners and water supply agencies to address the important issues related to groundwater quality in this context. Episirus Scientifica holds 2019 Environmental Science and Climate Change Conference (2019ESCC) around the theme " Sustainable Development: A Major Challenge Across the Globe": Organising a unique forum in Singapore during the month of September 10th-11th, 2019. 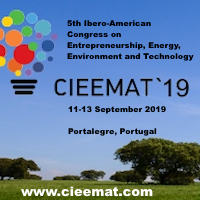 The 5th Ibero-American Congress on Entrepreneurship, Energy, Environment and Technology - CIEEMAT is a forum for discussion and creation of synergies among different students, professors, researchers and professionals to favor the development of Entrepreneurship, Energy, Environment and Technology. The challenges of higher education for the 21st century, such as the centralization of educational procedures in the student, and the sharing of experiences between institutions at the level of international cooperation, double graduation, and cooperation with the community, are also discussion topics in this conference. 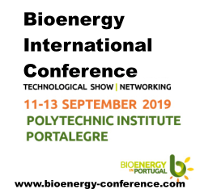 This congress is organized by researchers of the C3i/IPP (Portalegre, Portugal), and the AREANATejo, Energy Agency (Portugal) and has the objective to join academics, researchers and companies in an international forum to discuss matters related to bioenergy technologies, economic and policy aspects. We believe that we must rethink, personally, institutionally and corporately, the management that we make of the waste we generate and the energy that we have available. That’s why we have created this congress and exhibition, that we hope can be part of our contribution for a more efficient use of these resources. The Conference will focus on a sustainable transition of the economy from fossil-based products to biomass-based alternatives; it is the biggest research challenge for the next decades. Die Klausurwoche gibt exzellenten Nachwuchswissenschaftler/innen aus unterschiedlichen Disziplinen die Gelegenheit, eigene Arbeiten und Forschungsvorhaben in den folgenden bioökonomischen Themenbereichen zu präsentieren und intensiv zu diskutieren: Philosophie und Ethik, Landwirtschaft und Ernährung, Natur und Umwelt, Energie und Rohstoffe, Marktmechanismen und Technologietransfer, Recht und Regulierung. Dabei sollen ethische, rechtliche und soziale Aspekte der Verfahren und Ziele der Bioökonomie ebenso diskutiert werden wie ihre ökologischen und wirtschaftlichen Dimensionen. Für praktische Einblicke sind Exkursionen (u. a. zum FZJ) geplant. Es wird zudem ein Ländervergleich mit den Niederlanden angestrebt, da sowohl mit Blick auf die ökonomische Ausrichtung beider Länder als auch hinsichtlich ihrer normativen Debatten unterschiedliche Schwerpunktsetzungen bestehen. Ergänzt werden die Beiträge der Teilnehmer/innen durch Fachvorträge von ausgewiesenen Expertinnen und Experten. Interessierte Nachwuchswissenschaftler/innen sind eingeladen, sich mit einem Abstract (400–600 Wörter) und einem kurzen akademischen Lebenslauf bis zum 01.05.2019 unter biooekonomie@drze.de zu bewerben. 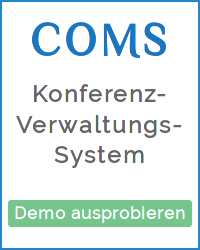 Die Konferenzsprache ist deutsch; Abstracts und Vorträge werden aber auch in englischer Sprache entgegengenommen. Alle Beiträge zur Klausurwoche werden in einem Tagungsband publiziert, der auch gemeinsam entwickelte Handlungsempfehlungen enthalten soll. With the support of our Sponsors, Exhibitors, and Members, the Midwest Section hosts an Annual Two Day Technical Environmental Conference providing the best buy for your conference buck. The 22nd biennial conference of The International Society for Ecological Modelling (ISEM), under the theme eco:model:spaces, will bring together scientists from all professions and applications that deal with the use of ecological models and systems ecology. Innovinc International welcomes you to attend the FORUM OF REVOLUTIONS IN RENEWABLE ENERGY IN 21ST CENTURY during October 07-09, 2019 Rome, Italy. We cordially invite all the participants who are interested in sharing their knowledge and research in the area of Renewable Energy.FOREN21 -2019 anticipates more than 150 participants around the globe with thought provoking Keynote lectures, Oral and Poster presentations. This is an excellent opportunity for the delegates from Universities and Institutes to interact with the world class engineers, Directors and CEO’S, Researchers , Lectures and Students from Academia. Reducing the dependency for fossil resources goes hand in hand with replacing traditional technologies by new processes. One of the main challenges on this journey is the switch from continous energy generation to fluctuating energy sources, like wind and solar. Power-to-X technologies will help to level energy supply and demand. Operating committee of Renewable Energy, Bio-fuels and Green Technologies Congress (REBFGTC2019) is inviting to discuss with your fellow Scholars across the Globe on 22 & 23 of Oct 2019, we are requiting to submit abstracts focus on theme " A Fuel for the Sustainable Future". Renewable Energy, solar energy, Bio-gas, green Technologies. On behalf of Scientific Committee of REBFGT2019, Ascend Meetings is inviting take part in a two-day international event Renewable Energy, Bio-fuels and Green Technologies Congress as a Speaker or Delegate to discuss and exchange with your fellow scientists of Renewable Energy, Biofuels and Green Technologies around the globe. The theme of the conference is A Fuel for the Sustainable Future and meeting will be held in Rome, Italy during 23-24 of the October 2019, from 08:00 to 19:00. Ascend Meetings, build collaborative partnerships and relationships with research centers, universities, institutes, technology transfer offices and academic communities, through networking, to ensure a flow of high quality research information. The Air & Waste Management Association is proud to announce a new specialty conference on Freight & Environment: Ports of Entry that will be held on October 23-24, 2019 at the Penn Station Hilton Hotel in Newark, New Jersey. This conference will explore many solutions to reduce the environmental impacts of all freight transportation, focusing on ports of entry. COGEN Europe, COGEN Spain and ACOGEN invite you to their Annual Conference and Gala Awards Dinner in Madrid, Spain. At this largest event of the cogeneration sector in Europe, we will discuss the latest trends from the energy world in the presence of industry representatives, policymakers and other key stakeholders. We will focus on the role cogeneration can play in achieving Europe's climate and energy goals. The purpose of this International Process Metallurgy Symposium is to bring together researchers and industry experts to share latest results and developments in the area of Process Metallurgy, or extracting metals from their primary and secondary raw materials in a sustainable manner. This Symposium has the sub-title of “Metallurgy as a tool for challenges in circular economy”, which emphasizes the important role metallurgy and metallurgists have in solving the resource deficit in metals and minerals. We have already seen the shift from “traditional” raw material research towards recycled materials and their impact on metallurgical processes. Another emerging or growing trend is the need and request for minimizing and utilizing waste in processes. All this underlines the importance of fundamental metallurgical research, knowledge and education, when we are changing from linear economy towards Circular Economy of Metals. The presentations of the Symposium focus on secondary raw materials or their elements’ behavior in metallurgical processes, or industrial integration. The topics have theoretical, experimental, simulation or modeling, as well as industrial approach. Further on, environmental and advanced materials preparation issues in the secondary material processing are also covered in the Symposium. A unique opportunity for European and international Impact Assessment professionals and planners to promote best practice in Strategic Environemntal Assessment (SEA) in Europe, enhance the impact of IA within sustainable development and decision making, take part in continuing professional development, and to discuss regulatory amendments impacting on practice. The 4th International Symposium on Materials and Sustainable Development ISMSD2019 (CIMDD2019), continues the traditions of the highly successful series of International Conferences on the materials, processes and Environment. The Symposium will provide a unique topical forum to share the latest results of the materials and sustainable development research in Algeria and worldwide. The annual BSR Conference is one of the longest-running and most well-regarded sustainability conferences. We provide a space for thought-provoking conversations, where we work together to identify solutions to our most complex global challenges. We convene more than 800 participants from around the world, including senior executives from Fortune 500 companies, entrepreneurs, foundations, nonprofit organizations, and governments. Be a part of it and help your company define its own blueprint for sustainability. With over 40% of the world’s population now living in rural areas, there is global interest in research associated with the creation of “Smart Villages” to address the ever growing urban-rural divide. Smart Village research being undertaken in the Faculty of Architecture, Building and Planning at the University of Melbourne is exploring rural community development, practices and relevant policies with a focus on community-centric planning of affordable housing, infrastructure, sustainable development and growth, community empowerment and other issues related to the creation of Smart Villages. RAMIRAN “Recycling of Agricultural, Municipal and Industrial Residues in Agriculture Network” is a research and expertise network set up over 25 years ago to improve nutrient utilisation and minimise the environmental impact from livestock manure and other organic material use in agricultural systems. This conference was last held in 2017 and attracts up to 250 delegates from across Europe and further afield.